Early Saturday morning on my weekend getaway, my sister and I walked from our hotel to Glass Beach. I had been there several years ago and remembered it as completely unimpressive, so I was surprised at how stunning it actually is. 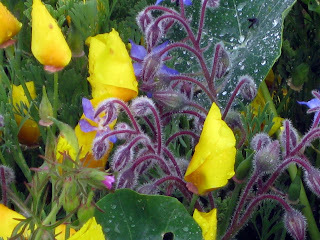 The mist and rain added to the beauty of the rocky shoreline. I left this heart where I found it so that the next person can enjoy discovering it. We went for a walk at Hendy Woods, which has the most beautiful grove of old growth redwoods that I have ever seen. Normally the serenity of the park is disrupted by the sound of gunfire from a nearby shooting range, but we didn't hear it this time. My brother-in-law, who is a Star Wars fan, says "it feels like the Return of the Jedi out there." There are many boutiques and art galleries in the town of Ft. Bragg and Mendocino Village. This is a sculpture made with branches and pieces of handmade paper. 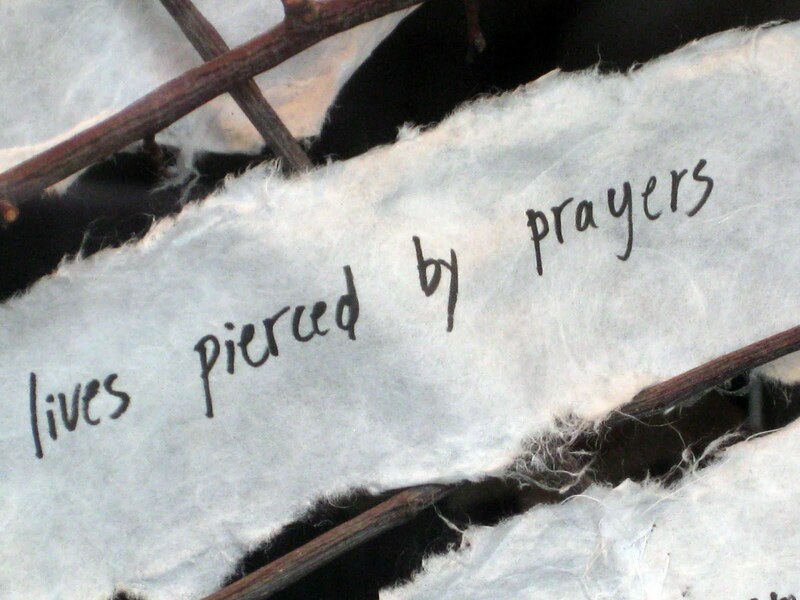 I love art that incorporates the use of words. 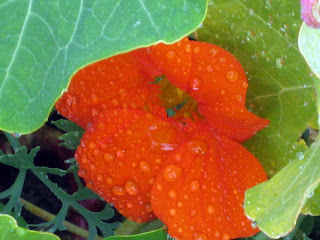 The nasturtiums and poppies flourish in the cool coastal climate. I couldn't resist a few close-ups. What beautiful scenery. It just looks so... serene (I guess that's the word I'm looking for, but even that doesn't capture it). Lovely. Will you show us your treasures - both natural and purchased? 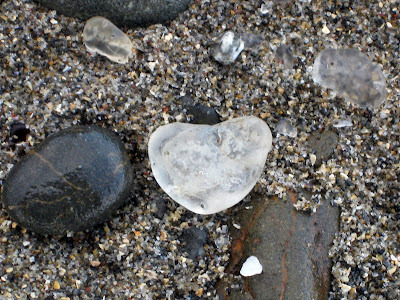 the beach glass..where is that? 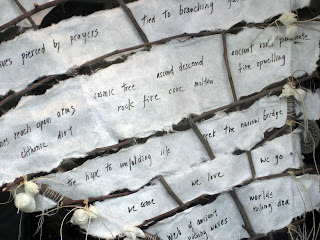 And that work of art with words and twigs...fantastic....What is it exactly? I am putting that place on my list of places I MUST go someday! 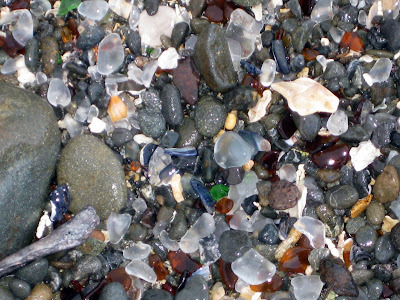 I want to see all of that sea glass! I just love the colors! Thanks for sharing all of these beautiful pictures from your trip! Have a blessed evening! HUGS! My kids would love to visit a place like that! What a lovely account. The photos of the Glass Beach are truly astounding. Are you in any danger of cutting your feet when you walk on it? Beautiful! Wish we had sea glass like that over here. How amazing is that beach! I love the rocks on the shoreline and the glass - so much! I wonder why it collects there? The pounding surf? You know I love to collect sea glass - you could make a wire-wrapped pendant - it's very easy - with your favorite piece. Let me know if you need help! I wish I was there now !!!! Absolutely gorgeous!! What a lovely trip. Stacy, oh sweet Stacy. What a wonderful post. Looks like a fabulous and fun-filled weekend. That area of the California Coast is so, so beautiful. Love the sea glass. The redwood trail. The sweet basket with notes. You take the greatest photos. Off to create a new blog post for Pink Dogwood Blossome. Lots of fun. what a great post and now I have to visit glass beach next time I have a few days and want a road trip!!!!! I work at AFAR travel magazine, based out of San Francisco. We're doing a story on Hendy Woods State Park, and would love to speak with you about possibly using your image of the path in Hendy Woods as an image in our upcoming issue. Please email me at Dani@afar.com in order to discuss this further. Thanks! Hope to hear from you soon. I love your Hendy Park pic, well actually I love all your nature pics, and your philosophy.